It's not that hot in the Bay Area today, but for a child inside a closed car, it can quickly get hot enough to be deadly. Already this year, heatstroke has claimed the lives of two children in California, and 24 nationwide. Wednesday is National Heatstroke Prevention Day and experts like meteorologist Jan Null are reminding parents that anyone can make the mistake of forgetting they have a child in the car. Closed cars can heat up faster than you might think. In Fresno last month, a 15-month-old boy died when a couple returned home from errands, and each thought the other had brought him into the house. It doesn’t take long for temperatures inside a closed car to skyrocket to dangerous levels. Null conducted a study in 2002 that documented the temperature inside closed cars over time, using a range of outdoor temperatures. He found that the car heated up at the same rate, whether the starting temperature was cooler or warmer. Average temperature rise over time, inside a closed vehicle. In just 10 minutes, it was 19 degrees hotter inside the car than outside. After 20 minutes, it was 29 degrees hotter inside the car. Null says infants and children overheat quickly. 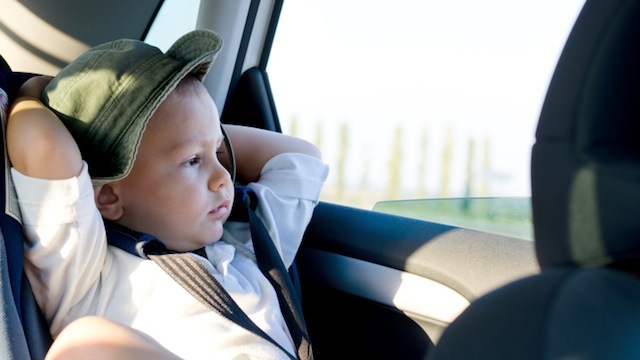 In California, it’s illegal to leave a child of six or younger alone in a car when conditions in the car could threaten the child’s health or safety. But in the majority of cases – 52 percent -- when children die of heatstroke in a car, the parents or caregivers are not flouting they law. They’ve simply forgotten the child is still in the car. In another 30 percent of cases, the child has gotten into the car on her own. That’s why transportation safety experts are recommending all parents adopt prevention tools, like an automobile exit routine. "Look before you lock,” is the slogan of the National Highway Traffic Safety Administration. The NHTSA recommends that parents walk around their car and look in all the windows before locking up. The agency also recommends putting something you need for the next stop – like a cell phone or purse – on the floor in front of the child’s car seat. That way you won’t get to work having forgotten to drop off the sleeping infant at daycare (because today isn’t your usual drop-off day, after all) and then just leave your car and scramble to the meeting you’re already late for. Other prevention tools include asking the childcare provider to call within ten minutes if your child doesn’t show up as expected, always keeping your car locked, and teaching children never to play inside a car. When a child is lost, look first in any nearby pool or pond, and look second in any nearby cars, including the trunks, says the state Office of Traffic Safety. And if you see a child alone inside a car, experts say, don’t waste time trying to find the parent; a child can die too quickly in the heat. Call 911 immediately. The parent may be embarrassed when they discover what’s happened, but the child may still be alive.